If you add Draw Something’s social gaming experience to Who Wants to be a Millionaire, then you’ll get the Qrank daily quiz iPhone app by Ricochet Labs. You compete against friends in your social networks, your area, and globally to determine who dominates in business, history, geography, entertainment, and current events trivia. For sports buffs, there is a daily sports quiz, so you can claim your ESPN habit and sports game filled weekends are a necessity. The Qrank social quiz iOS app is filled with bold graphics and clear navigation, as you earn points and climb the leaderboard. The graphic vibe has a cool, yet edgy sensibility. It’s dark with a touch of steampunk, and there is constant movement and fluidity in the graphics that flow through the screen. Other details draw your attention with subtle movement like the Twitter and Facebook social integration buttons. When there is color, it is bold and primary. The punches of color also tend to lead to action items on the screen. Great green pop-ups guide you, when, “Yo! It’s tutorial time.” If you need to refresh your memory about the meaning of icons in the game, a tap on the screen yields a bright blue banner with information. It’s like the Qrank iOS game is wearing a funky beauty pageant sash. The Qrank iPhone social quiz app’s navigation is a successfull combination of responsive, intuitive gesture controls and a clearly-defined menu bar at the bottom of the screen to get to home, games, results, friends, and awards with one touch. The object of the Qrank social quiz iPhone app is to answer 15 of 20 questions. The Qrank quiz screen interface is a matrix grid of icons representing categories. The difficulty of a question determines the points available. Certain questions have bonus points that are revealed when you touch the category icon. When you answer a question, you select from four different answers with a touch on the screen. You can also stop time, poll others, decrease answer options, and pass. As you answer each question, you can watch yourself climb up and down the leaderboard via a sliding bar on the right side of the screen. The questions are just challenging enough to be compelling and draw you back, but not too difficult to exclude lots of potential Qrank iOS app addicts. 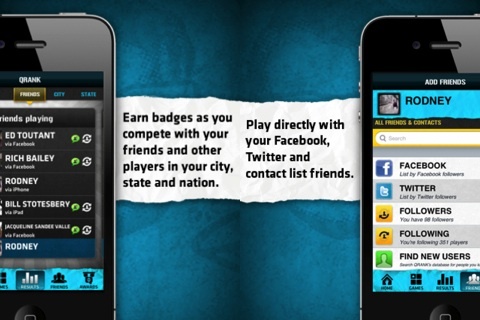 The Qrank Trivia iPhone app has an ad banner to support the free version. The ad banner changes just frequently enough to be a nuisance. If you’re committed to a daily round of Qrank, then the in-app purchase to eliminate ads is a reasonable investment. 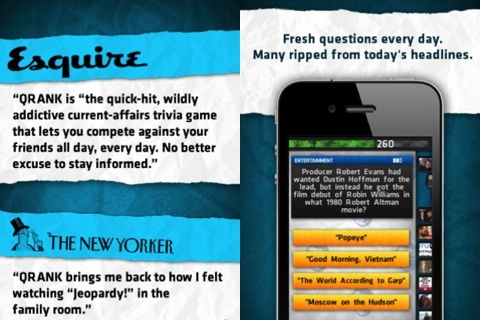 The Qrank Trivia social quiz iOS app is fun, addictive, and exciting. AppSafari review of QRANK Trivia – New Questions Each Day was written by Jenni Ward on July 5th, 2012 and categorized under App Store, Featured, Free, Games, Social. Page viewed 4182 times, 1 so far today. Need help on using these apps? Please read the Help Page.